After the success of our SwimRun events over the past few years at Tooting Bec Lido we are back on Wednesday 3rd July 2019. Entries will open in the new year, but please register your interest to be the first to know! SwimRun is a fast growing endurance sport first conceived in Sweden, and made popular in the UK with Breca SwimRuns, in which you run and swim between two predefined points along a set course of runs and swims without stopping in between. Similar to an aquathlon except that participants switch between running and swimming many times during a single race, running in their wetsuits and swimming in their trainers – no transition. Find out more about SwimRun here. Competitors will alternate between swimming and running completing a total of 1km in Tooting Bec Lido and 8.8km around Tooting Common. Swimming in your footwear is recommended but you can remove your shoes and transport them in the swim, this could include using a dry bag or float. Flotation devices are permitted during the swim, this includes pull buoys and tow floats. Use of hand paddles and flippers is allowed. You will enter the water feet first. Diving is not permitted. You must return to the finish with the equipment that you started with, you cannot leave items around the course. Mandatory equipment for team and solo competitors; there will be a mandatory equipment check at registration. Swimming in your trainers can seem like a challenge but it doesn’t take long to get used to it. Shoes that are light weight, buoyant and that drain well are the best for SwimRun. They’ll need to be a good tight fit to stop them coming off when you swim. Wear quick drying synthetic ankle socks to help prevent blisters. Wetsuits are optional, but recommended if the water is under 15C and you are not acclimatised to cold water. There are now SwimRun specific wetsuits available but if you are new to SwimRun there is no reason why you can’t give it a go in the wetsuit you already own. 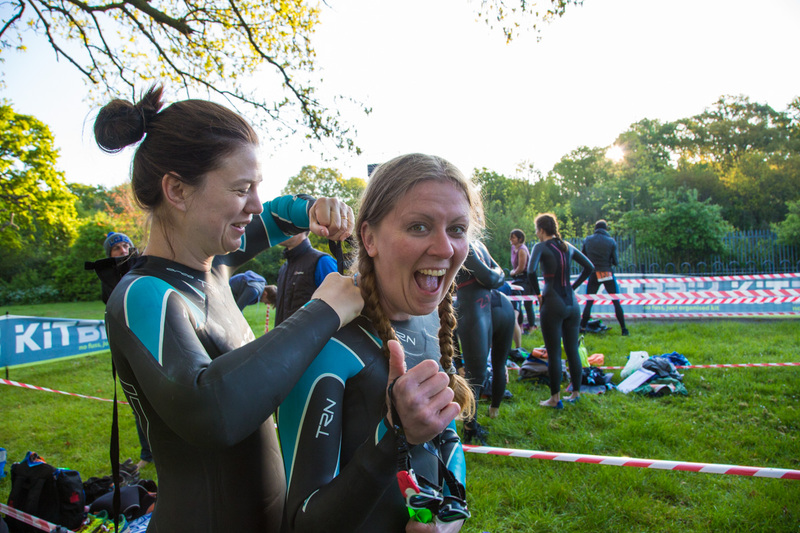 A regular full swimming wetsuit will certainly do a perfectly good job for you in the swimming stages, it will just take a bit more getting used to when you find yourself out running on dry land. Some people take a pair of scissors to a standard wetsuit cutting just above the knees and the elbows, allowing better freedom of movement when running. SwimRun rules state that you can use any flotation aids so long as they are no bigger than 100 cm x 60 cm – imagination is your only other limit! Most people just use a pull buoy which you hold between your legs instead of kicking, gives you extra buoyancy and allows you to save your legs during the swims. You’ll appreciate this when it is time to run! Many people use hand paddles for SwimRun. These add some extra power to your stroke. There are loads of different paddles on the market, but you’ll need some that have straps to hold it on your hand or they can easily come off and be lost in open water. You’ll also need to think about how you are going to carry them on your runs. You may enter solo or in teams of two. The original concept of SwimRun was always to race in pairs. Teams will be required to swim and run together throughout the event, offering support throughout along with a camaraderie rarely found in other events. 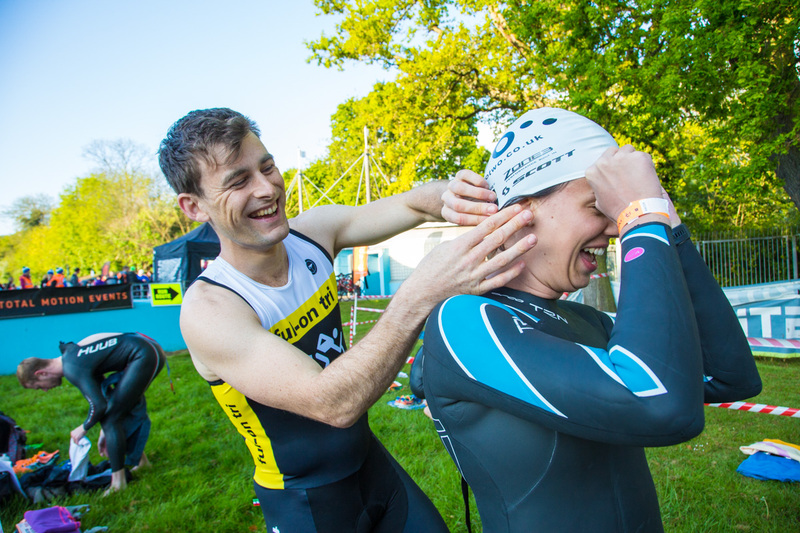 SwimRunning with a team mate can be a really fun and sociable experience and supporting each other and sharing in your successes adds a fantastic dimension to the event. You do need to find someone at a similar level to you in both running and swimming, or be prepared to adjust your speed accordingly. 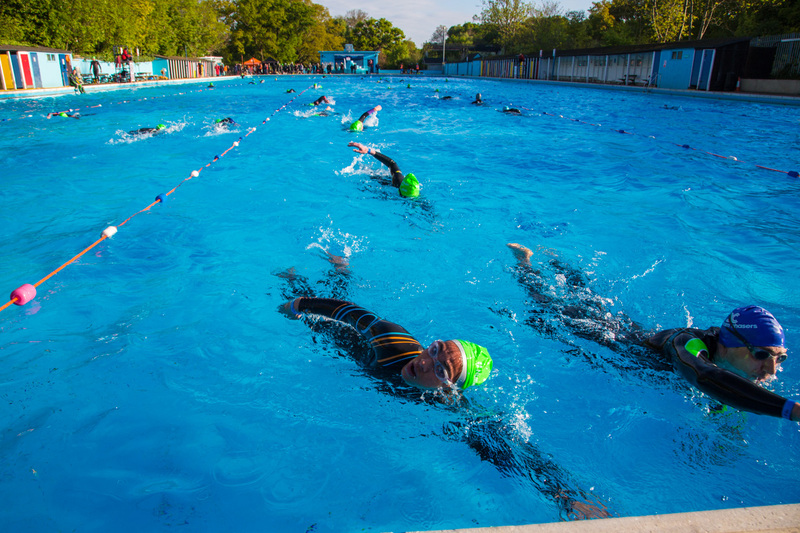 The Tooting Bec Lido SwimRun comprising 4 swims and 4 runs. Is the SwimRun open to everyone? The event is open to anyone over the age of 18. Is the SwimRun Chip Timed? Yes, the event will be professionally chip timed allowing you to receive a print out of your splits as well as viewing the results online post event. You will receive your chip on a neoprene band to attach to your ankle at registration. Can I enter as a team? Yes, the event is open to teams of 2. Each member of the team is required to complete the full distance and stay within 5 metres of each other throughout. They will not be tethered. When does event day registration open? Registration will be open from 1 hour prior to the start, where you will be given race numbers and final instructions for the event. There will be a race briefing prior to the start. What is the run route? The 4 run routes will be signposted and marshaled and can be seen on the map. Will there be safety supervision? Life guards will be present at the pool, as well as marshals on the run course for your safety. There is no transition as competitors will run and swim in all of their kit. There will however be a bag drop facility. You will need to bring your printed race confirmation. What do I need for the event? Participants must wear a tri suit or similar if not wearing wetsuit. Yes, refreshments will be available on the day. Are there changing facilities & showers? The lido has changing and showering facilities that are available to all competitors before and after the event. Spectators are more than welcome and actively encouraged, so please bring your friends and family along to cheer you on. Events such as these cannot take place without the very kind help of volunteers. If you are coming along to spectate, why not get involved too? 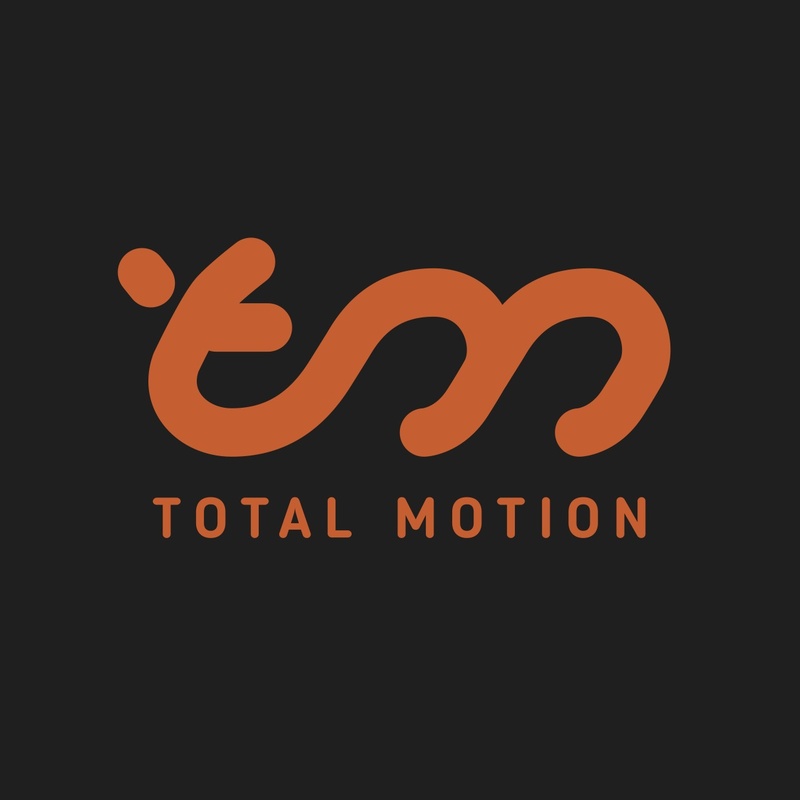 Please e-mail info@totalmotionevents.co.uk if you would like to help. There is a small car park at the lido and parking in the surrounding roads, although you are encouraged to arrive by other means if possible.